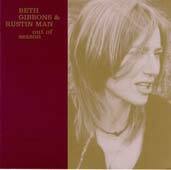 This was a very exciting project: take Beth Gibbons, the vocalist for trip-hop übergroup Portishead, and team her up with Paul Webb (here calling himself Rustin Man), bassist in pre-post-rock band Talk Talk. Two fine musicians in their own rights, together they will surely produce a work of lasting beauty, and stunning innovation, right? Sadly, the answer is no. This album is not a strange collage of electronic patterns (a la Webb's work in 'O'Rang) with Gibbons husky, wonderful voice. I was expecting an even more experimental and atmospheric take on the Portishead sound that Gibbons personifies. The reality of what this collaboration produced is not bad by any stretch of the imagination. It is just not as good as i had thought/hoped that it would be. Basically, rather than being ultra-futuristic, Out of Season wanders in a very retro mood. Instead of looking towards the future, Gibbons and Webb explore the well-mapped out terrain of their influences. Webb, apparently, is fascinated by the acoustic guitar. And together both he and Gibbons seem to share a love for folk music and old school blues. This album explores that, and while they do it well, it just wasn't what i wanted. The blues numbers on this disc really stand out best. On Tom the Model Gibbons asserts the bold claim that she is as powerful a singer as Aretha Franklin or Etta James. A bold claim, and yet she has the pipes to back it up. Her voice is wonderful on this song. My favorite on the disc is Drake, which sounds like old jazz. The drums are brushed, an upright bass thwucks away in the corner, and Gibbons stands front and center just belting it out. There is also an oddly-placed harmonica solo that really works in this tune. Other songs are folkier. Resolve is mellow and hushed and sounds like country-influenced folk music a la Joan Baez or the like. The light acoustic work in Mysteries is propped up and strengthened by Gibbons voice singing delicately, and a female backing chorus. Overall, i am disappointed that the album is not as good as i had hoped it would be, but i am not disappointed in it overall. If Gibbons wanted to prove that she is a world class singer, she has done so. Her voice is the star of this album, and if you are a fan of her then you will enjoy this. If you like folk music or retro jazz vocals, this might appeal to you as well. However, the beats and turtlenecks crowd that makes up the core Portishead fan base will not be too impressed. It's not as good as i hoped it would be, but it's not bad overall.